Who doesn’t crave crunchy chips, smothered in melted shredded cheese and fresh salsa or picante sauce? How about some spicy ground beef and beans? Top it all off with chopped onion and chili peppers or jalapenos, and you’re ready to dive in. Hey, Cinco de Mayo is coming, and nachos are on the menu! Check out these fabulous nachos recipes from an assortment of food writers. No, these aren’t just the spicy-cheese nachos you might find at the football stadium or the baseball park. These recipes produce hearty appetizers or even casual suppers. 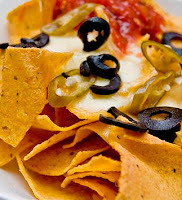 Perfect for parties, nachos are crispy, cheesy treats often served as appetizers, snacks or meals. Nachos can be a fast and easy weeknight dinner. Instead of plain old nachos, these nachos are spiced up with both chicken and black beans. Did you know that you can actually enjoy nachos, while still sticking to a healthy lifestyle? The key is to choose healthy toppings and homemade ingredients. This is a meal that I serve at home. It is nachos with a twist. Did you know you can make your own delicious tortilla chips for nachos? Tortilla chips are one of the most popular chips used for dipping. 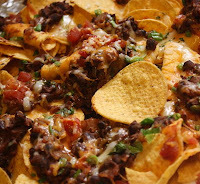 Many people like to have tortilla chips with salsa, bean dip or with nachos. Tortilla chips are served as a side dish with many Mexican dinners. Nachos for dessert? Why not! These Berry Dessert Nachos are made with baked cinnamon tortilla chips topped with berries and a low fat cream topping. This dessert appetizer is not only delicious and easy to make, but is suitable for those on a diabetic food plan. Thanks :) I absolutely LOVE nachos! Ah, nachos! I can almost taste them. Yum. I love nachos. I wasn't sold on the idea of dessert nachos, but I had some chocolate nachos at a restaurant and they were incredible. Why not make them at home? Checking out your other blogs. You're very ambitious! Most impressive blog. Loved the pics of the food, looked delicious. Yvonne. from A to Z Challenge. Nachos is one of my fave quick and easy meals. I fix a couple of cookie sheets full in the over at once and its great for the kids to just gather around the table and eat off the platter.